Beautifully turned brace-back Windsor armchair with bottle-stem turnings; in 19th c. black paint with gold striping. Leather on seat replaced; otherwise structurally all original. A graphic and unusually versatile room-size hooked rug in excellent condition. A rare survivor—a complete early window set with elaborate heart decorated ironwork grille, shutters, and frame. 31 3/4” w. x 38 1/2” h.
Fine 17th c. repoussee brass arm’s dish depicting Adam and Eve (with dog and rabbit), in excellent condition. A fine Queen Anne side chair from the workshop of Nathaniel Dominy. East Hampton, Long Island, c. 1790. In period faux rosewood graining. A lively and wonderfully detailed 17th century English needlework picture depicting David and Bathsheba. 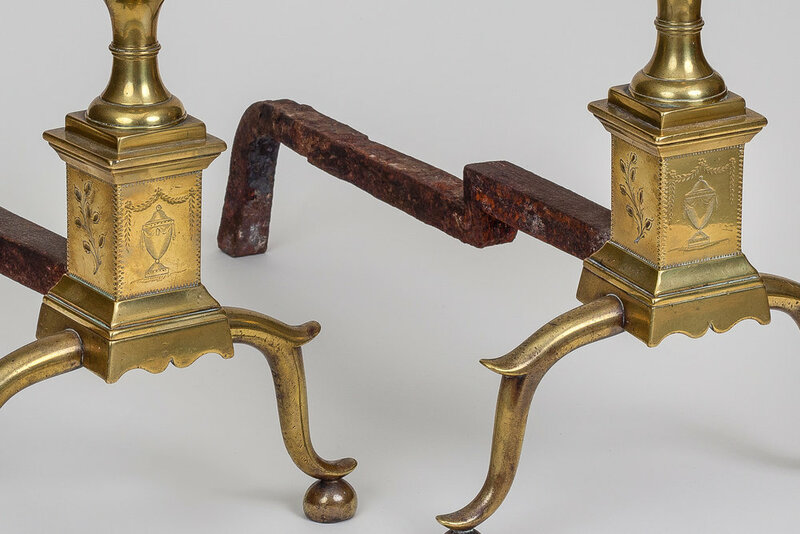 A very fine pair of New York andirons engraved on the front with Washington's Tomb. Unsigned, but attributable to R. Wittingham. First quarter of 19th c.
For a nearly identical pair signed by Wittingham, c. Schiffer, The Brass Book, p. 75, figs. A & B. Best pair of double wedding ring hog scrapers we've seen. Beautiful 18th c. steel snuffer stand signed "Dowler." Rare 17th c. Westerwald jug with the most unusual decoration of a dog chasing a boar chasing a deer. 7 ½” h. (finial); 6 ½” h. (body). A very fine "Gothic" candlestick with beautifully balanced baluster turning in excellent condition. 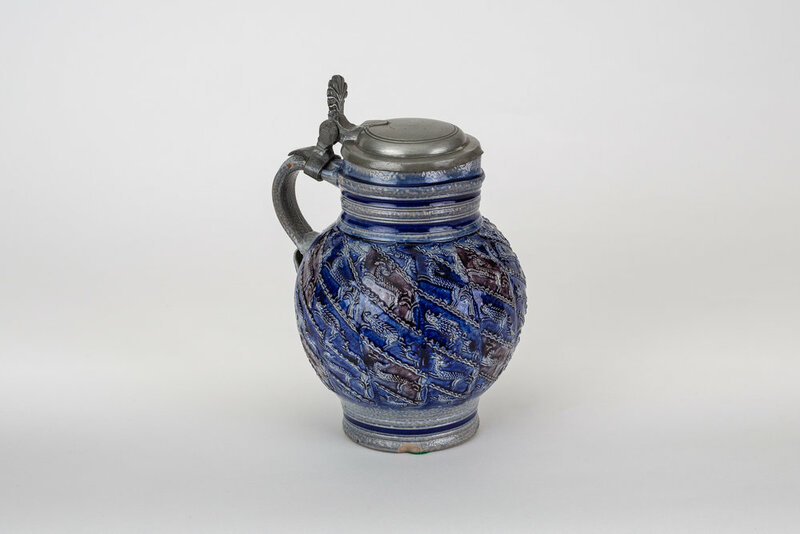 Rare diminutive 18th c. German faience tankard with charming decoration. A very rare 16th c. German stoneware “bartmannkrug” in excellent condition. America, prob. CT, and northern Europe, 2nd half 18th c.
An unusually sophisticated courting mirror with carved broken-arch pediment and scalloped bottom surrounding reverse-painted glass. The elaborate cherry carved frame appears to have been made here to encase a simple European courting mirror. In excellent condition, missing two tiny pieces of glass from interior eglomise frame. 19 ½” h. x 13” w.
Provenance: Israel Sack, Inc., New York, Sotheby’s, Sale 6483, Oct 24, 1993, Lot 283. Exhibited: Museum of American Folk Art, 1983, ”The Keene Eye,” fig. 69. A large, unusually folky (and subtly suggestive) Westerwald tankard in excellent condition. Lid initialed and dated 1774. 11” h. to top of thumb piece. 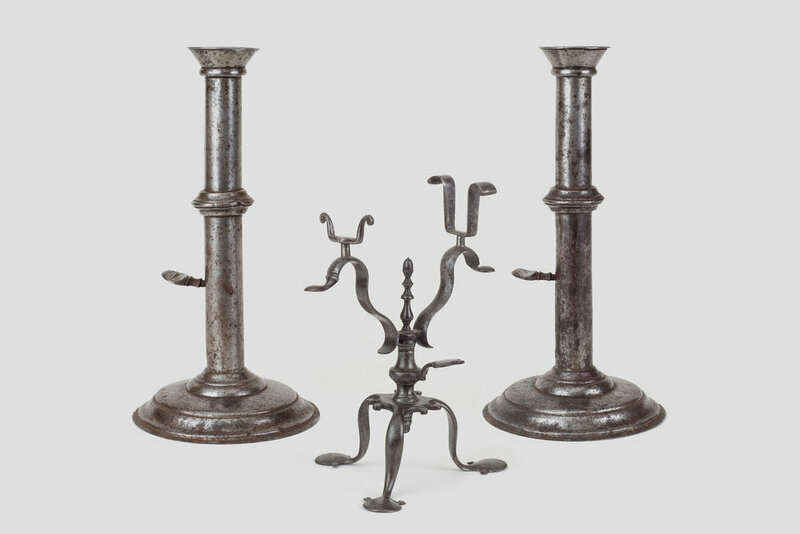 A group of three exceptional 18th c. rushlight holders on original treen bases with excellent patina. Extremely rare rushlight holder with twisted iron stem and counterweight arm on treen cross-base stand in fine old finish. 8” h.
Rushlight with scrolled iron counterweight arm on treen base in fine old color. Vertical shrinkage crack to base. 11 1/2” h.
Finely wrought steel rushlight and candleholder on turned wooden base with old finish. Small vertical shrinkage crack to base. 10 1/4’ h.
Westerwald, Germany, last quarter 17th c.
A large and impressive bulbous stoneware jug with flowers and vine decoration in excellent condition. 10 1/2” h.
For related pieces, cf. Unger, Die Kunst des deutschen Steinzugs, p. 181, fig. 147. Charming small bulbous jug with applied rosettes. 5” h. (stoneware), 6” h. to top of thumb piece. Two small hairlines to neck. For related piece, cf. German Stoneware: A Catalogue of the Frank Thomas Collection of German Stoneware, fig, 219.